Is Matt Wallace the next Ian Poulter? Everything about his gutsy golf suggests the 28-year-old shares very similar qualities to the renowned Ryder Cup legend. Both play with an intensity, passion and confidence that sets them apart. They maximise their abilities, cast aside self-doubt, and possess massive mental strength. Wallace showed this best with seven birdies in eight closing holes to win the Made in Denmark tournament on Sunday. It was his third win of the year, his fourth European Tour victory, and 10th professional triumph in the past two years. His comment after winning - "To do it in the style I've done it in is pretty special and kind of shows who I am - my determination and grit" - was pure Poulter. And Wallace has certainly put himself in the conversation about who should be named on Wednesday as Europe's four Ryder Cup wildcard picks for this month's match at Le Golf National near Paris. Three years ago he was ranked 1,672nd in the world and playing on the lowly Alps Tour. A year ago he was still outside the world's top 150. Now he is firmly on the mind of European skipper Thomas Bjorn. Bjorn has a tricky decision over the final four names for a team that already contains five first-timers to face the holders. Who would you pick as your Ryder Cup wildcards? 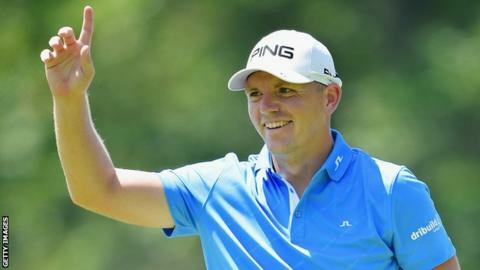 Wallace, from Hillingdon in west London, is on a shortlist that includes Poulter, Paul Casey, Henrik Stenson, Sergio Garcia, Rafael Cabrera Bello, Thomas Pieters, Russell Knox and Matt Fitzpatrick. The key question for Bjorn is whether to base his picks on form or class. "Traditionally you picked on class," Padraig Harrington, one of Bjorn's vice-captains, told BBC golf podcast The Cut. "But I think the last Ryder Cup proved that experience is not always best. The experienced players last time did not play as well as the rookies." Who has already qualified for Europe's Ryder Cup team? For that match in Hazeltine, captain Darren Clarke had three selections. The form horse was Pieters, who collected four out of five points on his debut. Lee Westwood, meanwhile, lost all three of his matches, and Martin Kaymer collected only one point out of a possible four. "Now a bigger consideration, no doubt, is given to form," added Harrington. "Obviously if some player performs really well at the end, like Thomas Pieters the last time round, he is always going to be right in there." That would seem a big tick in the box for Wallace, but what will concern Bjorn will be the balance of the team. Jon Rahm, Tommy Fleetwood, Tyrrell Hatton, Alex Noren and Thorbjorn Olesen - the last man in - will all be making their Ryder Cup debuts. "I think our rookies are strong," Harrington said before the Danish qualifying finale. "So it really does come down to a combination of what players suit the golf course, what player suits the foursomes and fourballs, and who you think will win singles points." The Irishman added: "People seem to think you have to pick the best player, but that's not the case. You have to pick the best player for the team." Poulter has always been that type of golfer - an inspiration on and off the course. With a win and four other top-10s this year, he has enjoyed a productive season. But it is no surprise he is reliant on a wildcard pick. The Englishman has not qualified automatically for eight years. A career record of 13 points from a possible 18 and his pivotal role in the 2012 "miracle at Medinah" make him a near certain selection for this Ryder Cup. Casey is too classy a golfer to be overlooked, even though he has not played for Europe since the 2008 defeat at Valhalla. The 41-year-old rejoined the European Tour this year, returned to winning ways on the PGA Tour, and lives in the world's top 20. He also boasts an impressive matchplay record and is another Englishman impossible to ignore. Stenson is the next most likely to receive the captain's call. The Swede has forged a strong partnership with Justin Rose, has played in four Ryder Cups and commands huge respect on both sides of the Atlantic. But the 2016 Open champion has suffered with an elbow injury that clearly needs managing, and this will provide a degree of concern for the captain. At the start of this season, the thought of Europe being without Garcia would have been unthinkable. But last year's Masters winner has been in wretched form, with seven missed cuts in his past 12 events. His best performance in this period did come at the French Open where he fired a third round 64 at Le Golf National, but is that enough to convince Bjorn that Garcia deserves a ninth Ryder Cup? The skipper may want to further delve into the Spaniard's statistics. In his first four matches Garcia won 75% of the points on offer to him before that percentage slipped to 44% in the next four contests. A better Spanish bet could be Cabrera Bello, who took two and half of a possible three points in a very impressive debut two years ago. He has seemed inhibited by the pressure of the qualifying process this time, but came close enough to warrant serious consideration. He has two top-five finishes on the Albatross Course at Le Golf National in the past four French Opens, but did miss the cut there last June. Fitzpatrick made a spirited charge for the final qualifying spot with closing 66s in Denmark, but has probably not done enough. Likewise Knox, despite him being runner-up at the French Open and winning in Ireland the following week. Pieters is a more likely bet after his brilliant debut and finishing sixth at the year's final major, the PGA Championship at Bellerive, last month. His form is returning and Rory McIlroy loved partnering the big-hitting Belgian at Hazeltine. That is an important consideration. Bjorn says he is already pretty certain of his picks. "There's still one little doubt in my head," he said, while Wallace was completing his thrilling win. Did that victory settle the issue? More likely it added to the confusion. Bjorn is a considered and pragmatic character and my bet is he will not want any more rookies. Therefore, I expect Poulter, Casey, Stenson and Pieters or Cabrera Bello to get the calls, and for Wallace to be invited along as an observer. It would provide invaluable experience for a character who seems the heir apparent to Poulter, albeit probably not for this Ryder Cup.